The modern home is becoming more digitized and computerized. For many, these changes mean the addition of many different digital devices in living room décor. When decorating or designing a living room, many still think first about various furnishings and accents but electronics are continuing to play a larger role in the room’s visual effect. By using electronic appliances a lot of functionality can be added to the living room area. It can make it much more enjoyable for family and guests. There are numerous electronic appliances used in modern living rooms but some of them are highly popular and end up in many living rooms today. Perhaps the most common living room appliance is a television set. Over the last few years as electronics have gone digital, the standard television has gotten much smaller. Many have an entire entertainment system which contains a TV and others now hang a flat screen TV on the wall for easy viewing. When the television is on the wall it offers very good visibility. Others prefer to incorporate an entertainment center or a gaming center along with the TV. Gaming devices are one of the fastest growing trends when it comes to electrical devices used in the living room. A game center allows occupants to play electronic games that are displayed on the television set. In the world of electronics, there are many different types of game systems. Some families designate the primary television to gaming while others choose to keep the primary TV for watching entertainment only and designating a smaller television for games. Many times those who play electronic games in the living room will use head phones so that the other family members can enjoy watching their favorite shows. Entertainment centers are designed to hold all the family’s electronic equipment and the television set so that it is uncluttered and organized. Many homeowners today are using the television as a central feature and turning their living rooms into a complete home entertainment center. This can be as elaborate or simple as the homeowner desires. Many prefer to keep it simple and include a television set and a DVD or blue ray player. Others set the living room up to be a home theater center with a large screen TV that is large enough for entertaining guests. The entertainment center may contain a wide variety of electronic appliances including the television, DVD or blue ray player, DVR and a surround sound stereo system. Electronic devices are commonly used to enhance movie viewing. 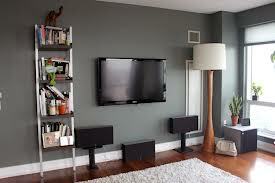 Another electronic appliance that is common in today’s living room is the stereo. Sound systems for the living room can be just a simple CD player or a surround sound system that is hooked up to the television to enhance the movie watching experience. Speakers can be placed around the room so that they are visually pleasing and there are no visible wires to distract from the décor. Modern advancements in electronic devices have ways to incorporate modern devices such as the iPod or other MP3 players. This allows users to plug an iPod into a dock and play all of their favorite music on the stereo system. By using various adapters and electronic parts different devices can be used to play music on through the sound system. Lighting is a very important electronic feature in today’s living room. Many have their home lighting systems set up so that it can be totally controlled using a modern device such as an iPad or other electronic system. These types of apps can be used for A/V controls or lighting features. Various lighting features might include recessed lights, step lights, cove lights, track lighting or sconces that are designed to serve a particular purpose. Before beginning a movie on the TV lighting can be turned down or dimmed through the use of an electronic device. The iPad can even be used to start the movie if you have the right app. Some apps on computerized devices have a movie mode which will automatically turn the movie on and the lights down simultaneously. Game mode on a computerized device might turn the lights down in one area of the living room while leaving another tier of lighting on for the kids to play. There are many such electronic devices which can enhance today’s living room.